Cafeteria food. What more is there to say really? I mean, we’ve all been there before: eating out of Styrofoam trays, discovering the “spork,” and finding out that there really is such a thing as Mystery Meat. So what exactly possessed us to believe that college cafeterias would be dishing out 5-star meals every day? Whatever it was, we were sorely mistaken. Sure, they’ve stepped it up a little, but still, just like in elementary school, comfort foods and the salad bar are the bulk of our sustenance. (And then we wonder why the “freshman 15” turns into the college 25). Other than calling the cafeteria “the dining hall,” nothing has really changed. Right? Wrong. Now we can cook! So who’s to stop us from taking the drab dining hall dishes and fancying them up a bit? Let’s choose an All-American sandwich turned gourmet: the Grilled Cheese. Candice Allouch is a junior at American University but abroad in Florence, Italy during the fall semester where she learns (and loves) to cook with the wonderful ingredients that Europe lends. Note: If you’re like me and you like to “borrow” ingredients from the dining hall so that you can cook in your room but you don’t have a Panini press, then here’s a tip: you can create your own makeshift Panini press by using a couple of pans to toast/melt/heat up your food. You take the first pan (very lightly buttered) and drop the sandwich in it. Then take the second pan bottom down (after being heated for 5-7 minutes) and press it on the top of the sandwich. The bread will toast, the cheese will melt, and the rest of your delicious sandwich will turn PANINI! 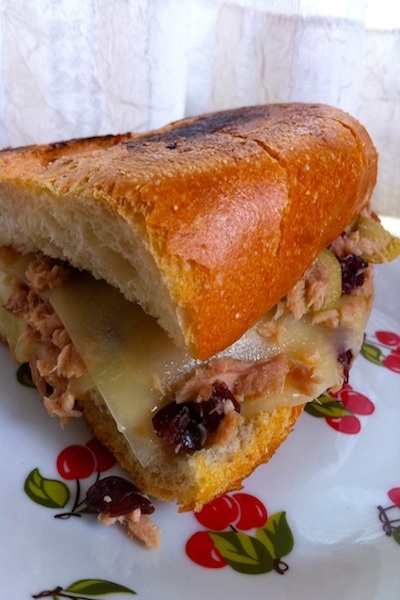 Place the tuna, cranberries, olives, and olive oil together in a bowl, and mix to incorporate. Then, on a plate, put your first slice of cheese on the bottom bread of your sandwich. Stack the tuna mixture on top. Finish it off with the last piece of cheese and the top bread. (If you’re doing this at home in your makeshift Panini press, I would start the stacking in the pan). When you’re done putting your grilled cheese together, walk it over to your dining hall’s Panini maker and get grilling! Leave the sandwich in for about 5 minutes (or until you can see the bread browning and the cheese melting). Grab your sandwich off the press and enjoy the yumminess! I assure you, the rest of the dining hall will be quite envious of your skills! Categories: Campus Cooking, Dorm and Dining Hall, and Recipes. I'm Cooking For...: Brunch, Dining Hall Sustenance, Easy Dinner, Hangover, Late Night Snack, Myself, and Senior Week. Hmm I’ve never seen tuna as a hot sandwich ingredient before, but this looks delish. Totally gonna make one when I’m home. Side note:Haha I’ve totally used the two pan method when we didn’t have a press. You should do Cuban tostada one of these days. Gotta love the make-shift panini maker you got going. 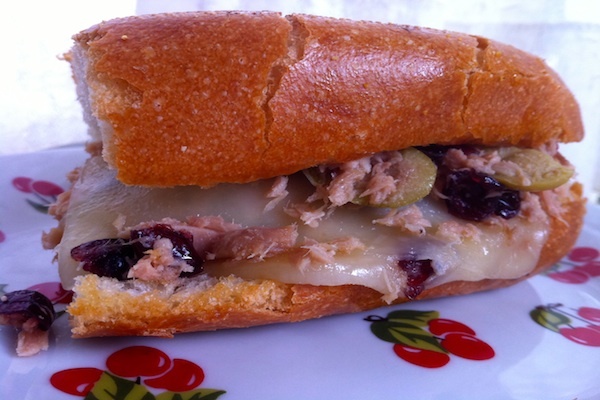 I am for sure going to try this recipe out, I get so tired of eating the regular old sandwich, tuna and the cranberries…makes my mouth water!